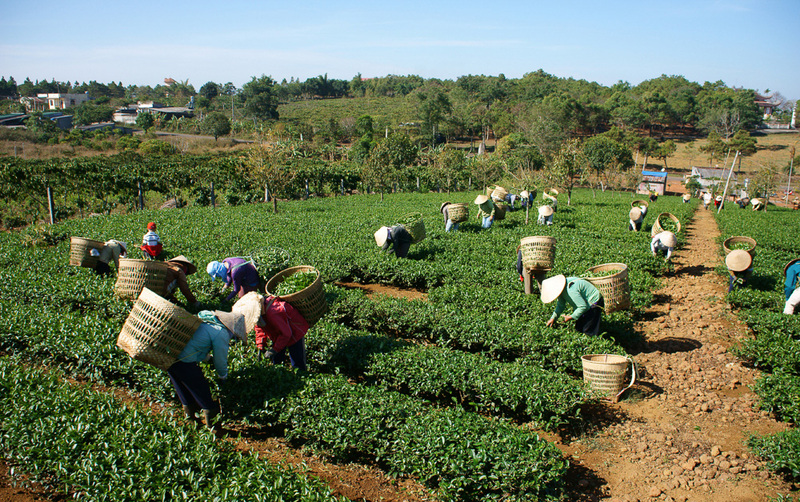 Tea pickers in Vietnam. Photo by Thai Nguyen. Production in Vietnam is labor intensive on a large scale. Since the 1990s, when the Vietnam economy opened to international trade, the government priority has been to generate foreign currency earnings. For the tea and coffee industries this has meant an aggressive and entrepreneurial focus on high-yield crops at the expense of quality. Vietnam’s growth came entirely from commoditization. Sixty-five percent of its tea production is basic black leaf but this accounts for 78 percent of 2017 exports. The global low-end black tea market is losing consumer appeal. The 2017 Vietnam export price per kilo is reported to be 60–70 percent of the world average. Vietnam’s main customer, Pakistan, has been one of the “easy” markets for its commodity black tea. These are ones where low price is the dominant attraction, with import rules on levels of pesticide and fertilizer residues in the leaf far less stringent than the EU, Japan, and the U.S. 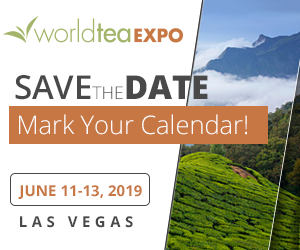 This encouraged heavy chemical overuse (the Ministry of Trade reported in 2017 that nearly half of the smallholders who supply tea to the 500 national processing factories exceed safe concentration and application). Packaging is poor and there has been little investment in brand building. Vietnam has around 25 percent of the Pakistan tea import market. In the first half of 2017, its exports to Pakistan dropped 1.4 percent in volumes but 6.3 percent in value over the previous year. The lack of standards and quality control is illustrated by the intermittent but growing scandals in Taiwan concerning Vietnamese tea being used to mix and market counterfeit high-priced Lugu Dong Ding oolong. 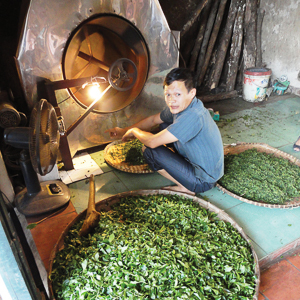 Authorities point to lax certification and low traceability of the Vietnam teas. 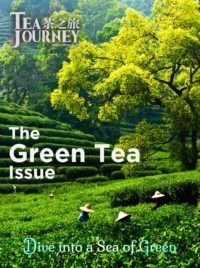 One 2017 program with international NGO sponsorship aims at bringing together 15 enterprises to train and support 16,500 tea farmers producing 25,000 metric tons of premium green tea. In early 2018, more than half the target companies had signed up. The tea will target Fair Trade certification. 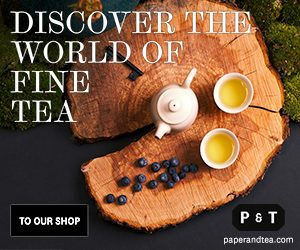 The national Center for Tea Research and Development announced in early 2018 that over the 15- to 20-year development period it has created five new clonal teas that are high yield (a 60–70 percent increase over the Vietnam average), with pest-resistance and suitability to premium black and green tea production. 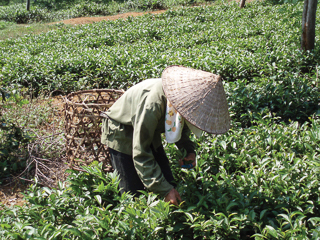 The PH8 clonal tea has been planted in Tuyên Quang province and in adjoining Laos, with promising results. Lai Châu province is providing incentives for large-scale adoption of PH8. Wild tea trees in Vietnam. The irony of tea in Vietnam is that the country has one of the longest histories of excellence in tea production anywhere. 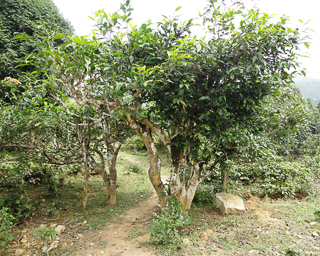 Its many ethnic groups still produce their own unique teas, mainly black but also oolongs. The country has many scattered clumps of wild tea trees in the 100-year-old range, though there are somewhat flimsy claims of thousand-year-old growths. Many of the Shan Tuyet wild teas (“Snow Mountain”) are stunningly excellent. There are fine Lotus green teas and good mid-range oolongs (many being marketed in Taiwan as fake high mountain teas). A growing niche tea of high reputation is Wild Boar tea, so called for the boars that wander the areas where local hill tribes pick the leaves. 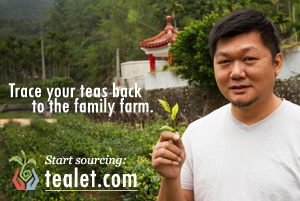 The best Vietnam teas are reaching the U.S. market especially, almost entirely through online specialty providers. Vietnam tea is clearly at a transition point. It must earn international recognition and market credibility, be able to gain trade certification, create brands, and build price robustness.